I have every reason to believe it works properly. It has been in the box for years, and never been used, but I have not tested it as it does not have its original adapter. I have a 120V adapter that fits, and that I haven't tried, which I will include if you think it would be suitable. I have read that most electronics make no distinction between 110V and 120V. The power adapter inlet is shown in the third photo. The integral sensors detect any change in air pressure due to an intrusion through all internal and external doors and windows (volumetric shock monitoring). Its deafening alarm is guaranteed to alert neighbours and scare intruders away immediately. 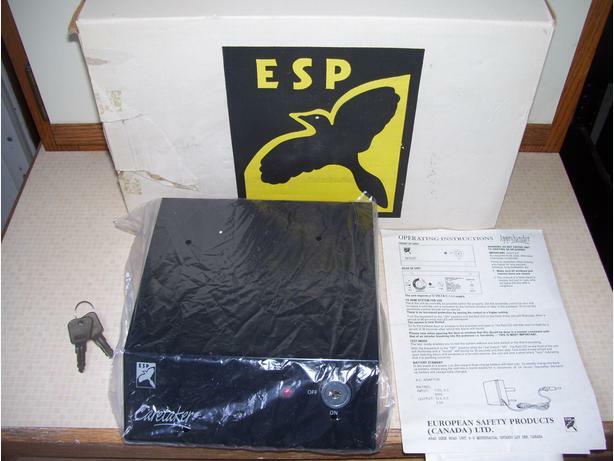 ESP revolutionary portable Caretaker alarm will protect your home from intruders at a fraction of the cost of most systems with the added bonus of no unsightly wiring. The Caretaker is simply plugged into a standard wall socket. Simple Set Up And Operation. Just Plug In And Arm! Made In UK by European Safety Products, Ltd.